Cyclone Phailin, which hit Odisha and Andhra Pradesh on Saturday, may not lead to huge losses for insurance companies. According to sector officials, the highest destruction is on “kuchcha houses” (huts) and public property. Hence, the number of claims is expected to be limited and early estimates, put there at well under Rs 100 crore (Rs 1 billion). “The number of claims will be limited, since most property that has been destroyed was out of the insurance purview. Though it is too early, it is expected that losses would only be in the range of Rs 50-70 crore (Rs 500 - 700 million),” said a senior official of a public general insurance company. The insurers have just begun to receive claims from companies. Till Monday, claims worth Rs 4-5 crore (Rs 40-50 million) have been received, mostly pertaining to projects in and around Paradip port. There is a possibility that claims may rise in the coming days. While the cyclone has weakened, coastal areas of Odisha are experiencing massive flooding. Plus, severe rain and flooding is expected in Bihar over the next few days as an aftermath of the cyclone. Once a claim is intimated, the insurer sends surveyors to the site to assess risk. This process hasn’t started as insurers are waiting for four-five days to pass after the event. 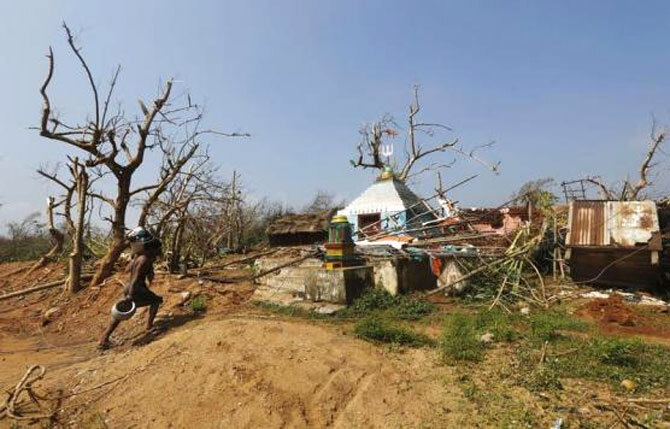 Image: A man carries his belongings as he walks past a damaged temple after Cyclone Phailin hit Arjyapalli village, in Ganjam district in Odisha. According to Amarnath Ananthanarayanan, managing director and CEO, Bharti AXA General Insurance, the industry could see some motor claims in the next few days. “There has been a lot of damage to property and power infrastructure. However, most of it, including mud huts, are not insurable. This is a reflection of the under-penetration of insurance in these areas, which are in dire need of an insurance cover,” he explained. Hence, he opined that insurable losses will be low. Apart from power transmission lines, crops have also been damaged due to the cyclone and its after-effects. A senior general insurance official explained that while more than Rs 2,000 crore worth of paddy has been destroyed, claims have not started coming in. The after-effects could lead to more destruction of crops, which could spike up the losses, added another official. Weather-based insurance schemes by general insurance companies will also provide for destruction because of floods and natural calamities. However, authorities said several hectares of paddy washed away by the cyclone have not been insured. 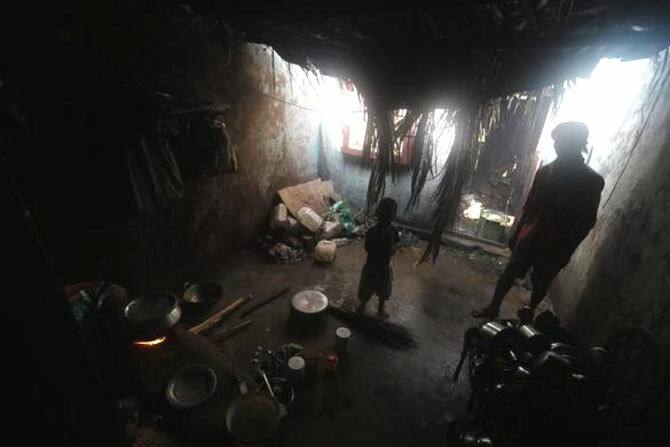 Image: A man and his son stand inside their damaged house after Cyclone Phailin hit Gopalpur village in Ganjam. Yogesh Lohiya, managing director and CEO of IFFCO Tokio General Insurance, said small houses, trees and public property have been impacted. “There is not much impact on industrial areas and industrial risks. Hence, losses could be low. However, we are keeping an active check on the aftermath of the cyclone,” he explained. Life insurance risks, too, have not been adequately insured. According to the senior executive of a private life insurance company, although 20-25 lives have been lost, there have not been any claims because the deceased were not insured. Insurance companies had estimated a total loss of Rs 1,500 crore (Rs 15 billion) from claims in the Uttarakhand tragedy. In June-July 2013, Uttarakhand was affected by floods and land-slides with severe loss to life and property. 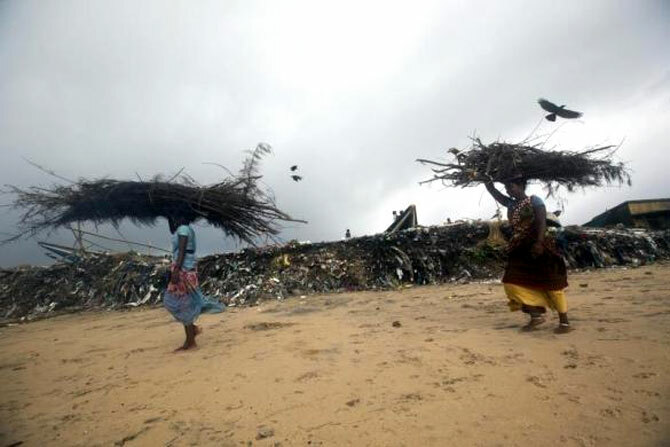 Image: Fisherwomen carrying wood walk past an eroded shore after Cyclone Phailin hit Puri.